Residents at a Yishun Housing Board flat said they are at their wits' end after being harassed by a neighbour for over a year, with one family going as far as to build a "wall" barbed with cacti on the common corridor for protection. The metre-high barrier, which has a latched gate and is made from scrap materials, has so far been effective, said residents. But the Nee Soon Town Council has asked for it to be removed as it is a fire hazard. A spokesman for the town council said it is engaging the residents involved and has suggested mediation and legal options to the affected neighbours. The Lee family, who live in an four-room corner unit and were the ones who erected the wall, said that the barrier was a last resort for them after having had to deal with the difficult neighbour since last December. They come home nearly every day to find an oil-like substance reeking of urine splashed across their door and along the corridor. Balls of toilet paper and used sanitary pads have also been found outside their flat and on their bicycle chained outside. The culprit, they said, lives on the floor below them with her daughter. 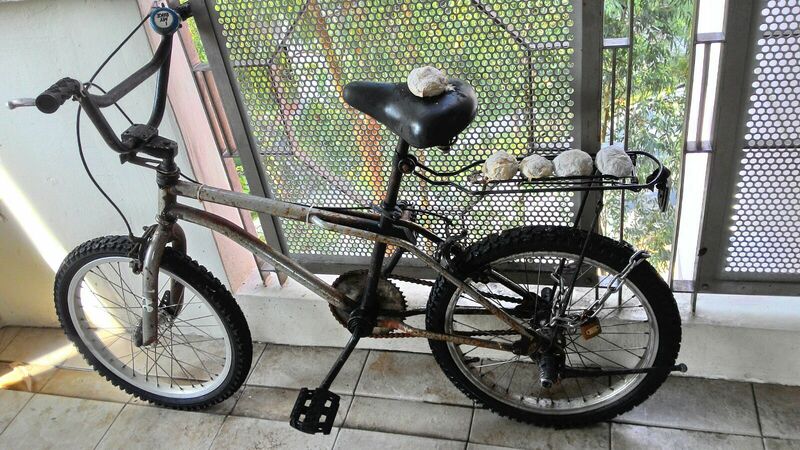 Balls of toilet paper were seen on a bicycle chained outside the Lee family's corner unit. Examples of disputes include complaints of excessive noise, smell or smoke, littering at or in the vicinity of the complainant's place of residence, and trespassing. IT consultant Edmund Lee, who lives with his sister and parents, said they first noticed the woman wearing sunglasses lurking along the corridor outside their flat last year. They installed a closed-circuit television camera outside their unit in February and video footage showed that she had been dirtying their corridor in the early morning hours, said Mr Lee, 28. In footage shown to The Straits Times, timestamped over several days in March, the woman is seen splashing liquid from bottles and pails along the corridor outside the two corner units. Madam Yeo Kim Hong, 65, who lives next door to the Lees, said she built a makeshift barrier along the corridor leading to their flats using a chair and a wooden plank earlier this year, but it did not deter the woman. "The oil is very slippery and dangerous," said Madam Yeo, a cashier. If we remove it she can come to our doorstep and start a fire, which is more dangerous. MR EDMUND LEE, whose father built the barrier from scrap materials. Both Mr Lee and Madam Yeo said they have never spoken to the woman, who runs away whenever she is caught in the act. Mr Lee's father, a 60-year-old delivery driver, replaced the barrier with the current one, which was lined with durian shells at first but those were removed due to the smell. The younger Mr Lee said they will remove the barrier only when the woman is arrested. "If we remove it she can come to our doorstep and start a fire, which is more dangerous," he said. No one came to the door when The Straits Times visited her flat over the last two days. Neighbours on her floor said that they have not been bothered beyond clanging sounds that come from her unit every morning. The police confirmed that reports have been lodged and said investigations are ongoing. Meanwhile, the National Environment Agency said that it has requested interviews with the parties. Said Mr Lee: "We have even thought of moving out after living here for 30 years, but who will want to buy (our flat)?"